Joined the company in 2011 as a Trademark Agent and eventually grew into the position of the Senior Trademark Counsel. 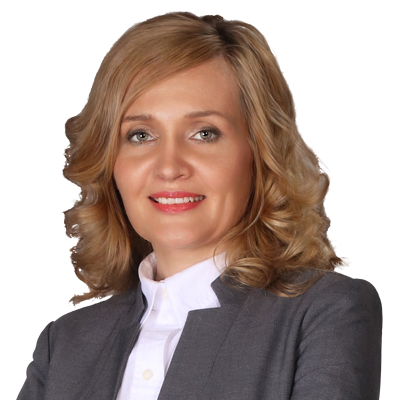 Her particular specialization within IP is management of trademark, copyright and domain cases, including preparing trademark applications, trademark renewal applications; trademark assignment and licensing agreements; negotiating and drafting the letters of consent and co-existence agreements, recordal of trademarks in the Customs Register. Victoria also provides legal advice on how to overcome provisional refusals issued by local TMOs of CIS countries for trademarks filed under national or international procedure, deals with oppositions for those CIS countries where such a procedure is available; advises on trademark, copyright and domain infringement; on trademark registrability issues in various jurisdictions within the CIS. Apart from the aforesaid Victoria manages domain disputes in Russia and other CIS countries, i.e. gives preliminary estimation on the chances of the successful outcome, supervises all the stages of the court proceedings including enforcement of the court judgement; draft the С&D Letters to the infringers, domain hosting and registrar companies. Osram GmbH, Moncler S.p.A, Chrono GmbH are among the clients whose interests have been successfully represented and defended. During her carrier in IPR GROUP, Victoria has obtained hundreds of LoCs as well as reached and drafted Coexistence Agreements on behalf of the clients including successful negotiations with such companies as Fiat Group Automobiles S.P.A, Mitsubishi Jidosha Kogyo Kabushiki Kaisha, Bridgestone Corporation, General Electric Company and others. Between 1995 and 2000 Victoria has obtained her university degree in Linguistics and then worked for the government in one of the CIS countries. During the service in government, Victoria completed a course on the system of effective management at the Russian Presidential Academy of National Economy and Public Administration. Between 2010 and 2013 Victoria got her second undergraduate degree Magister of Law from St. Petersburg Law Institute. She also completed the WIPO General course on intellectual property. In her free time Victoria enjoys the theater and live music, travelling, reading, fitness and jogging, yoga and horse riding.